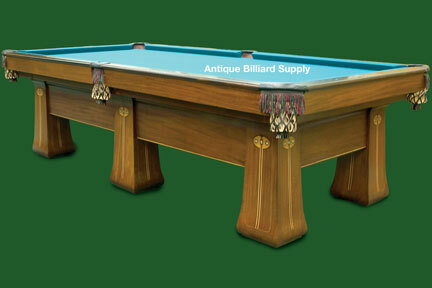 #1-16 Antique Brunswick pool table valued for its original design which features gently flowing curved leg surfaces. Ribbon mahogany veneer with inlay of contrasting woods and mother-of-pearl. Six legs and jumbo framework provide unusual strength and durability. Regulation 9-foot size, three-piece slate playing surface. Ready for delivery.